May 24, 2007: Sunny and 80* Water temp 74* and Clear. Got on the water at 4 this morning to catch bait and picked clients up at 6am. Went to a 25 ' flat , saw some fish and put downlines on them and caught a few but didn't like what I saw and moved on. Hit a few more flats with limited success and got on the big motor searching for larger schools. Found a nice school on a 30' flat , put the baits in their face and for 30 minutes my clients couldn't keep up. After that calmed down a bit I went to the mouth of a creek and found a school 400 by 400 yards wide and put baits on them and everything went off again. There were thousands of fish in the school but the smaller fish would strike the baits before the larger fish had a chance to eat . I was running low on baits by now so we left all those fish and found another school with nicer fish. 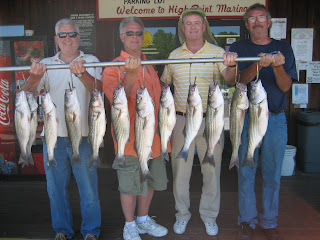 We ended up the day having well over 85 hits, clients keeping 13 Stripers for a cookout this weekend.